Animals World: What do lions eat? Where do Lions Search for Food? Lions are called the kings of the jungle, but they actually live in the savannahs and grasslands of Africa and India. Lions can be seen in almost all major zoos, and they will live up to and over 20 years in captivity. In the wild, their life span is between 10 and 14 years. Lions are social animals, living in groups called prides. A pride consists of several related females and their children, and a couple of males. When the male cubs are grown, they are kicked out of their mother's pride to go it alone. Lions are fierce animals, and the females (lionesses) do the majority of the hunting. They hunt in packs and bring home meat for the entire pride. Lionesses are some of the most skilled hunters in the animal world, and much of mankind's earliest art depicts the lion as the hunter. Male bachelor lions that don't have a pride will do their own hunting. 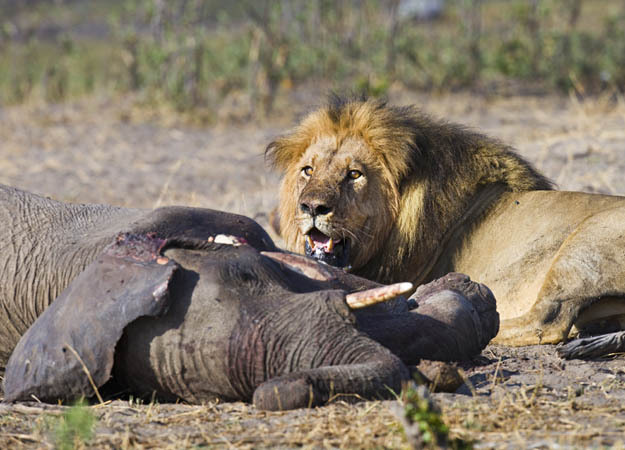 Lions hunt and eat other large mammals. In Africa, lions eat wildebeest, warthogs, zebras, buffalo and different types of antelope. In India, lions eat several different species of deer, as well as wild boar. Lionesses hunting in packs can take down fully-grown animals of prey species. They will not usually attack adult male buffalo or adult male giraffes, because they are large enough to pose a risk of injury. Rhinoceros, hippos and elephants are too large, and lions will usually only attack these animals when starving. A lioness needs to eat 11 pounds of meat a day; a male needs about 15 ½ pounds. 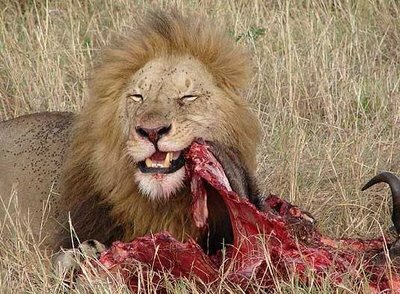 What do lions eat? They eat meat, and lots of it.